Wabash alumni gathered at the former Avon B&O (Baltimore to Ohio) Railroad site, which was abandoned after another railroad was laid to cover the same destinations and more, for the third consecutive year in support of Wabash Day. The railroad has been in the process of evolving from a railroad to a recreational trail in the “Rails to Trails” project completed in many parts of the nation. 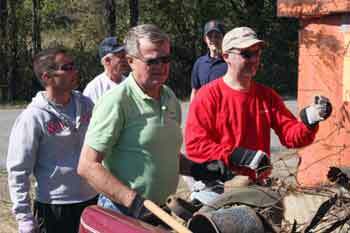 The Wabash men picked up trash and some larger items that have gathered over the years along the corridor. Farmers adjacent to the railway have disposed non-decomposable garbage in order to prevent erosion in their fields. The site also contained an abundant amount of rusted railroad equipment. “When I was approached to get involved with Wabash Day, I looked around and I saw that there was a lot happening with the B&O group,” said Dave Jackson ’87. “I had a lot of interest in what they were doing and trying to help develop this abandoned railroad corridor into a trail in Hendricks County. They are actually starting construction of the trail. The trail has been in the process of being paved. Hikers and bikers have already started using the trail. “It’s one person’s dream that’s now turned into hundreds of people helping and turning these unused railway lines into hopefully a fitness trail someday,” Kerr said. "Multiple teams of 17 volunteers from the B&O Trail Association and Wabash College alumni filled an entire roll-away trash dumpster with large items dumped along this abandoned corridor over many years," Jackson reported. "Items collected included 40 tires, household appliances, automotive parts, scrap metal and children’s play sets. Special thanks to some local Hendricks County businesses who helped with a discounted trash dumpster and with proper tire disposal. It is gratifying to see the ongoing Wabash – B&O partnership bearing fruit as the trail is truly becoming a reality."